Going through photos from my Alaska ride in 2010, I came across this one, and decided to write about it. On my way back from Alaska, I found myself in Dawson Creek, BC, at the start of the Alaska Highway (for me it was the end of the highway because I was going the other direction). I had been looking for a motel to stay the night and had ridden out towards the airport when I decided to stop and check my phone. I took off my gloves and stuffed them into the handrails on the backseat of my Honda ST1300. When finished, I turned around and rode back into the main part of town. I was in the downtown portion of Dawson Creek, along 102 Ave, where business seemed to be dead. I was stopped at an intersection pulled my phone back out to check the location of nearby motels, when a woman pulled up beside me in her car. "One of your gloves flew off of your bike!" she said. She had followed me this far just to tell me about it. I knew right away what she was talking about. I realized I had left my gloves stuffed into the handrails and never put them back on. "Where did you see it fly off?" I asked. "From your back seat!" she said. "No, I mean where in town?" "Oh, back on 8th Street!" I thought about asking her where on 8th street, since it's a big street, the main drag of the city. But I opted not to, because it appeared she was ready to get going. I turned around and headed back for 8th street. I rode slowly along the side of the road, scanning in all directions for a small summer glove either in the roadway or in the gutter. I must have traveled along the entire length of 8th street, and didn't find it. Finally I turned around and headed back, figuring my glove was lost for good, and that I would buy another pair. About halfway back, I saw it laying there, on a grate. 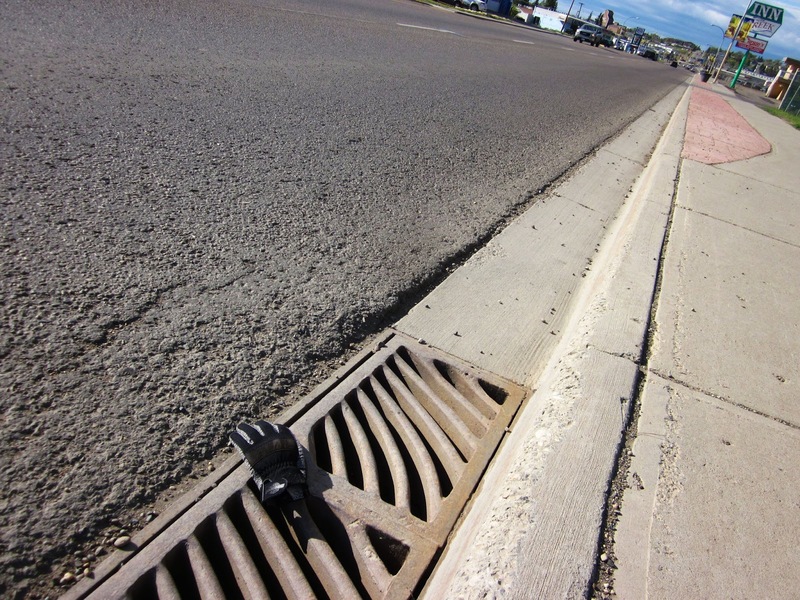 To think, that glove had traveled from China (where it was probably made) to San Diego to Fairbanks, AK and over to Dawson Creek, BC, only to wind up in the sewer. The stories it would tell to rats and other pieces of junk about the places it had seen over the past few years. And yet, I managed to rescue it. It was actually a pair of Harley-Davidson gloves I bought a couple years earlier at a Harley dealer in San Marcos, CA. It was only $19.99, which is really cheap for Harley gear. It had a thin leather layer for the palms, and breathable textile on top. I really like those gloves. I believe it was in Norfolk, VA, last summer on Road Pickle, that those gloves finally fell apart. I tossed them into the trash at a gas station. I had worn them for about 5 years. I can relate... I live in WI and was on a trip through CA. My riding buddy wanted me to take his picture. His camera only had a small view finder so I had to take off my glasses to take the picture.... Yup, 2 hours later when we stopped for gas I realized I didn't have my glasses. I never did go back for them. Good thing I can see without them! Don't you love how a photograph can bring back a memory like it just happened yesterday? I know we often take pictures to remember things, but some photos bring back memories quicker than other. Steve, that's a cool story. Sometimes the small things in life leave the biggest impressions.